It's been twenty years since Guillermo del Toro's debut feature Cronos was released, and in that time he has managed to build not one, but two careers as a director. In one, he makes small, intimate Spanish-language dramas which use the supernatural as allegories for Mexican-American relations and Spanish history. In the other, he is a director of big-budget, energetic action spectaculars like Blade II and the two Hellboy movies. (He even has two more sidelines if you count his extensive work as a producer of other peoples' films and his sideline as an author of pretty good vampire novels.) Despite the seemingly vast gulf between his careers, what makes his work interesting is that it all feels personal. All his films share his vivid love of colour, his sense of wonder at the power of storytelling, and his giddy, enthusiastic imagination. He invests himself and makes even his grandest epics feel human, even when his characters aren't. With his latest film, Pacific Rim, he gets the opportunity to play with his biggest canvas yet, creating a battle between good and evil that takes place on a global scale. At the same time, it's easily his least emotional film. That's not to say that he cares any less about Pacific Rim than any of his previous films; he's not a director who works on films that he doesn't care about, and the film itself is littered with little grace notes and touches which speak to del Toro's particular interests. No, it's just that it's hard to invest much humanity in a film about giant robots beating up giant monsters. The film begins with an extended narration from Raleigh Becket (Charlie Hunnam), who relates the history of Humanity's war against a race of interdimensional aliens known as Kaiju ("giant beast" in Japanese). Emerging from a fissure between realms which is hidden deep beneath the ocean, the Kaiju initially appeared infrequently, causing tremendous devastation and laying waste to coastal cities around the world. As they started to appear with greater regularity, the people of Earth banded together to create the Jaeger's (German for "hunter"): skyscraper-tall robots capable of defeating the Kaiju. At the point that the story begins, the war has been going on for years and the humans appear to be winning: The Jaegers have turned the tide of the war, Kaiju attacks are routine but contained, and pilots like Raleigh and his brother Yancy (Diego Klattenhoff) treat them as chances for adventure and aggrandisement. However, after one mission goes tragically awry, the Jaeger program is shut down in favour of building a giant wall to contain the Kaiju and protect the coasts. Predictably, the walls prove to be scant help at stopping monsters hellbent on mayhem, and soon Raleigh's old boss, the madly monikered Stacker Pentecost (Idris Elba) asks Raleigh to help implement a last ditch attempt to end the war. Deadened by past trauma, but determined to do some good, Raleigh reluctantly agrees. The biggest knock against Pacific Rim is that, while its battles are jaw-dropping in their scope and visual inventiveness, and its world is beautiful to look at even as it crumbles, del Toro struggles to breathe as much life into his humans as he does their machines. The Jaegers are beautifully crafted, complicated creations, neither of which are terms that could be applied to people who control them. As Raleigh, Hunnam does a perfectly fine job at playing a square-jawed, slightly damaged but goodhearted man, but the character is so bland that he might as well have been called 'Hero McMain-Character'. I was an hour and a half into the film before I realised that I had completely forgotten what his name actually was; he's that forgettable. Again, that's not Hunnam's fault, it's just that the script, by del Toro and Travis Beacham, gives him very little to work with. It doesn't help that he's almost indistinguishable from the hotheaded Australian pilot (Robert Kazinsky) who is meant to serve as the Val Kilmer to his Tom Cruise, but often ends up being the Jean-Claude Van Damme to his slightly different Jean-Claude Van Damme. Other actors fare better, though in many cases it's thanks to the charisma of the actor, rather than the words they get to say. Idris Elba brings the requisite gravitas and bone deep toughness to Stacker Pentecost, while also investing him with a softness in his dealings with prospective pilot Mako (Rinko Kikuchi), a young woman who has a deep and complicated connection to. Elsewhere, Charlie Day brings a lot of furtive energy to his character, a scientist and "Kaiju groupie" who wants to create a neural link to the Kaiju similar to that used by the pilots to control the Jaegers. Day particularly shines when paired with del Toro regular and living rock formation Ron Perlman as the improbably named Hannibal Chau, a seedy underworld figure whose gruff nonchalance regarding violence plays nicely off Day's giddy enthusiasm. They provide some surprisingly rare levity in a film which is otherwise a touch too serious for its own good. It's Kikuchi who makes the biggest impression, though it's fitting, given the way in which the Jaegers have to be controlled by two pilots, that it is for a performance in tandem with another actor. The best scene in the film is an extended flashback in which we see a young Mako (Mana Ashida) running through a devastated city during a Jaeger attack. Ashida's performance is so potent during the scene, so filled with blind, uncomprehending fear, that it makes Kikuchi's own performance, which is sometimes a little stilted and wooden, seem more effective and believable as an adult manifestation of such a formative trauma. It also plays into the broader theme of the story, which is ultimately that the only way to overcome past traumas is not to hide in memories and soak in vengeance, but to forge forward for the future. It's a surprisingly positive message for a film which spends so much of its time focused on (gorgeously choreographed) destruction, but an apt one considering the other themes running throughout the film; the need for cooperation, the need to fight the good fight, and the nobility of sacrifice. 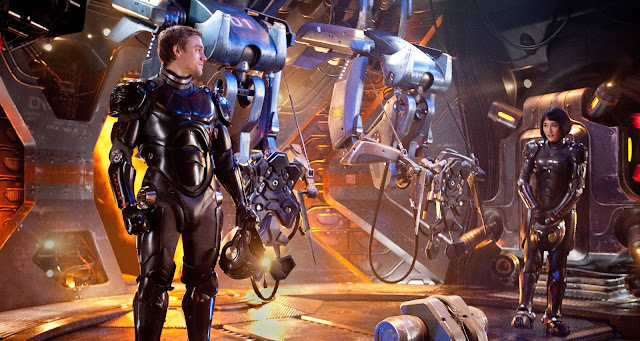 For all its cutting edge visuals, Pacific Rim is steeped in classic storytelling, and it's the sort of bold, morally grounded blockbuster that seems to have been lost in the Michael Bay era of destruction for the sake of destruction. While the human element of the film is largely diminished, the inhuman aspects are played up to glorious effect. While the Jaegers are distinct, individual devices that are packed full of fun gadgets that escalate and vary the fights, it's the Kaiju which are more impressive. Each is a unique, vast and terrifying beast capable of enormous destruction, and it's almost a shame that they only appear in the context of fight scenes. Del Toro has always had a keen eye for creature design, and each Kaiju has clearly been crafted with considerable care and attention to detail, and the film doesn't really give much opportunity to admire them: almost as soon as they appear, they are being beaten to a bloody pulp with an oil tanker or similar gargantuan makeshift melee weapon. It's the first del Toro film in which the monsters are there solely to be destroyed, rather than to be marvelled at beforehand. By no means perfect, and lacking the nuance or relentless invention of del Toro's best work, Pacific Rim is still a hugely enjoyable summer entertainment. It doesn't hold up to much scrutiny if you focus on the particulars, but the important thing with these kinds of films is not how flawless they are, but how well they stop you from caring about their flaws. Pacific Rim more than passed that test for me, since its action sequences are exhilarating and visually stunning enough to paper over the cracks without completely obscuring its bold, heartfelt themes. It may be more machine than man, but there is still enough blood to balance out the circuitry.